Let’s talk about the Glute Ham Developer or GHD, also known as the Glute Ham Bench. What is it? 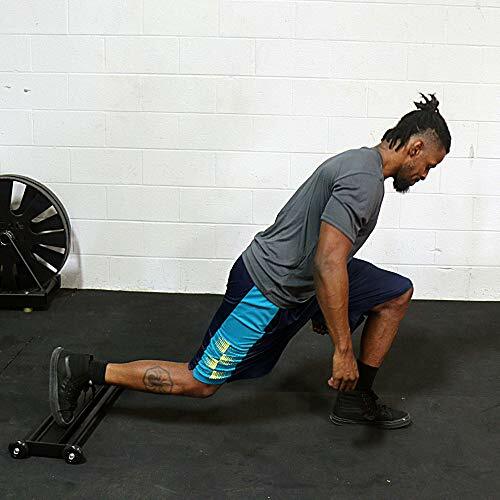 It’s a piece of strength and conditioning equipment that let’s you perform very potent posterior chain exercise including the Glute Ham Raise (GHR), the abdominal destroying GHD Situp, and even a poor man’s version of the reverse hyperextension. The model shown here is the Rogue Abram 2.0 GHD – and it’s excellent example of the features of a great GHD. Looking for Black Friday deals on Glute Ham Devices? Check back here for our recommended Black Friday deals on GHDs. Black Friday is the best time of the year to buy fitness equipment. A GHD is a great investment for a home or garage gym – but it’s also a pricey piece of equipment. It’s worth your time to figure out the best GHD device that will meet your needs before you buy. To that end, we’ll review some popular models – and give you an overview of what the “best of the best” offer. Then you’ll be equipped to make the buying decision that fits your needs, budgets, and goals. We’ll help you figure out the best GHD for your needs. More About The Glute Ham Raise Want to find out why the Glute Ham Raise (GHR) is an awesome exercise? 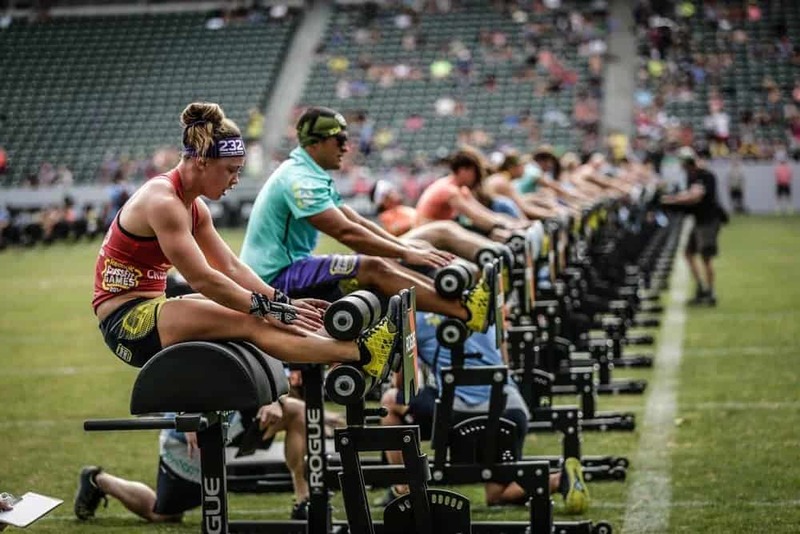 We’ve got you covered in this article: Why the GHR is a great leg workout. What makes a good GHD? Here’s the main criteria on which any potential GHD should be judged. Firstly, a good GHD has to be stable. The best unit will accommodate a variety of body shapes and sizes (and weights). When performing a GHR there’s a lot of body mass being supported in a cantilever fashion by the bench. The bench tipping over is not a good outcome for anyone. Bottom line, we need a stable GHD. What are the hallmarks? Weight – It is basic physics that a heavier bench will resist movement better than a lighter bench – especially for GHD situps. I’d shy away from any unit that was less than 100 lbs – and for a commercial facility I’d look for the beefiest unit possible – there’s no telling what size athletes you’ll have to accommodate. Floor Space Footprint – A unit with a wider base is going to be more stable. But this is always a trade-off between floor space and size. A great compromise is a triangular base design – this provides the benefits of a wide base, but in a more compact foot print. Weight Pegs – Some units have weight pegs on the back (the end where your feet are at). 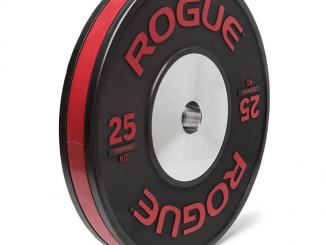 This means you can mount or store additional weight plates. This will help make things more stable, and can serve as a storage area as well. I consider this a “nice to have” – I’d prefer a unit is stable at all times – not just when it’s loaded up with lots of extra plates. Protective Rubber Feet – Rubber feet actually have a purpose beyond protecting the floor of your gym or garage – they can help smooth out any un-evenness in the floor – and this is going to make things more stable. Floor mounting holes – Some units have pre-drilled holes to allow for bolting the unit down to the floor. We’d recommend this for any commercial facility – for ultimate safety and liability reasons. For a home or garage gym, this may interfere with the ability to store or move the bench out of the way when it is not in use. Next up is the sheer size (height, width, and length) of the bench. How much room do you have to work with? There are some models that are more compact than others. And as mentioned above, the footprint of the base of the bench is a factor in stability. As with all things, it’s a trade-off. You want stability, but you also probably can’t dedicate a huge portion of your floor space to the device. Height x Width x Length – What’s the overall cubic space (inches or square feet) the unit requires? Compact vs Full-Size – There are compact units available. But can they accommodate the full range of motion you need? Are they robust enough for the size and weight of trainee in your gym or facility? Is mobility needed or desired? Meaning, do you have a need to move the equipment to store it out of the way when it’s not in use? Some units have wheels so you can easily store the bench away when it’s not in use. We do not recommend regularly lifting and moving a GHD – it’s a heavy weight in an awkward form factor. If you need to move the unit regularly, get one with wheels. Every GHD must be adjustable in the distance from the thigh pad or rollers to the foot plate – to accommodate athletes of varying heights and leg lengths. Adjustments every 1″ are common, and desirable. Every GHD has this feature, so it’s not really a key decision criteria. The foot plate/roller height is adjustable on some units. For a commercial facility that has to accommodate body types and sizes of all kinds it’s definitely recommended to get a unit with the height adjustment. Otherwise, it’s more of a “nice to have”. Other areas to consider are comfort. The split thigh pad or roller as compared to a single piece pad is considered the most comfortable unit. Why? Imagine which part of the anatomy can benefit from this arrangement… need we say more? In addition there’s different sorts of thigh support devices – some use rollers – which make it really easy to get into position – but also require a knee pad – otherwise you might roll too far. 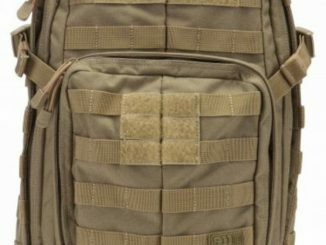 More popular are units that use a half moon thigh pad. This is a dense foam pad that doesn’t move. So it’s a little more resistance to getting into place, but doesn’t require a knee pad. 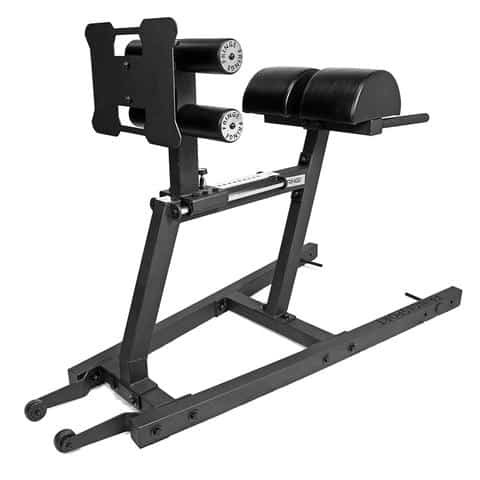 GHD as a Preacher Curl Bench? 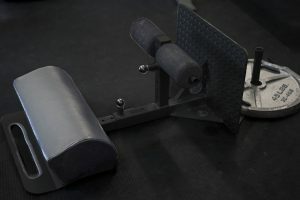 With the half moon thigh pad, you can also use a GHD bench as a Preacher Curl bench. 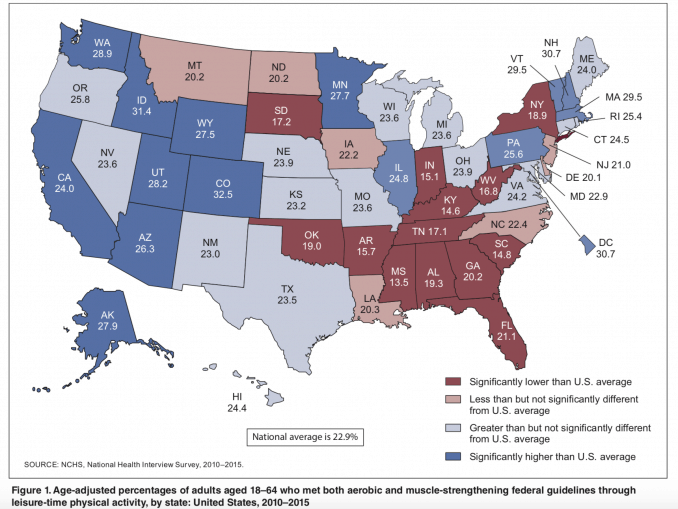 Just another reason a GHD is a great investment for a home gym. In my opinion, the half moon thigh pad (split – not single piece) is the ideal option. The rollers aren’t really necessary for your thighs, and having a knee pad is another upholstered item that can wear out or get torn. The positioning of the knee pad also makes it more difficult to get up on the bench. Therefore some units have a step up plate or stand to make it easier to get on and off the unit. Make sure you examine a bench to see if there are handles, knobs, or levers that are going to make it difficult to get on and off the bench. Lastly in terms of adjustability – and accommodating multiple trainees – a bigger foot plate is generally better than a smaller one. Why? because people have all kinds of sizes of feet – and when half your foot is hanging off the foot plate it’s definitely not ideal. In general, look for a sizable foot plate. And it’s got to be grippy and provide good traction. Diamond plate is popular, but there are other surface options that work just as well. Some very expensive units even let you adjust the angle of the foot plate. This certainly is nice – but I’ve not found it a necessary adjustment. Most benches have a good angle for maximum muscle recruitment designed in. The GHR is primarily a bodyweight exercise – the gravitational torque on your body provides the resistance. You can do the GHR (and other moves) with weight plates as well, but bands also provide an excellent way to add resistance and to make progress. Essential to using bands is being able to safely and securely mount the bands on band pegs. Some units have band pegs built-in, some have versatile band peg mounting holes that let you put multiple pegs in a variety of locations. Some units have no accommodation for pegs whatsoever. 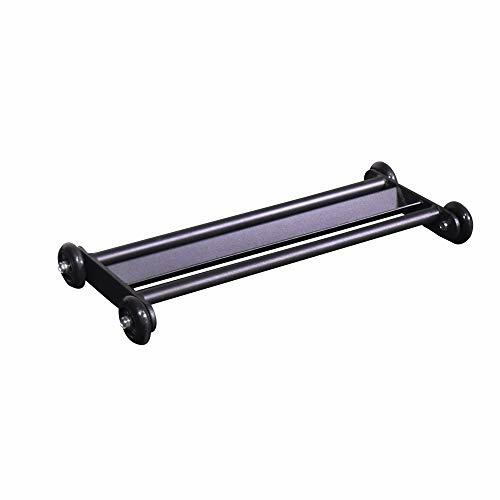 Honestly if you are investing in a GHD – get one with band peg mounting holes – they are the most flexible option. Glute Ham Machine or Glute Ham Bench? Some people refer to the GHD as the glute ham machine. But it’s not a machine – there’s no moving parts (other than the foot and ankle roller/pad). A fitness machine would have pulleys, handles, levers, etc. The GHD has none of these. Therefore it’s really a specialized sort of bench.Why does this matter? “Machines” are inferior to all other forms of strength and resistance training. They provide too rigid of a pathway for the movement and often isolate the movement into targeting too specific of an area.The best exercises (for nearly any purpose) are “complex” and “compound” exercises – utilizing the most muscle mass and often over multiple joints. Now that we’ve laid out the ideal features of the best GHD units – let’s look at some specific models and see how they stack up. 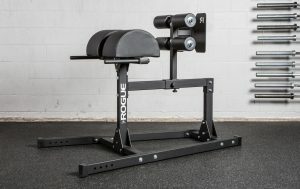 The Rogue GH-1 GHD is Rogue’s entry level, full-size GHD bench. Chock full of features – it’s a very robust unit. Made in the USA from 2×3” 11-gauge steel and the triangular base design is both stable and space efficient. This bench weighs in at a hefty 195 lbs – but it’s a bolt-together design that will help keep shipping costs reasonable. And, it’s got that legendary Rogue build quality. The high-density foam thigh pad is the half-moon split style that works best. The distance from the thigh pad to the foot plate is fully adjustable. And this unit has multiple band peg mounting holes – for a variety of band options. Band pegs and optional wheels (for portability) are not shown below, and are an additional cost. This would be a great unit for a home or garage gym. 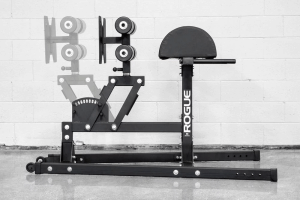 The next step up in the Rogue GHD line is the Rogue Abram 2.0 GHD. Like the GH-1, this unit has a space-efficient triangular base. But it’s an even beefier unit, weighing in at 222 lbs. It’s also a bolt-together design – which means you can ship it cheaper. It’s also got the variety of band peg mounting options and can accommodate wheels for the ultimate in storage (these cost extra). But, most importantly, it’s got full adjustability – both the distance from thigh pad to foot plate and the height of the foot/ankle rollers are fully adjustable. Adjusting the distance from thigh pad to foot plate is quick and easy thanks to the innovative slot adjustment design. Because it’s so robust, easy to adjust, and full-featured this would be our choice for a CrossFit box or commercial gym. 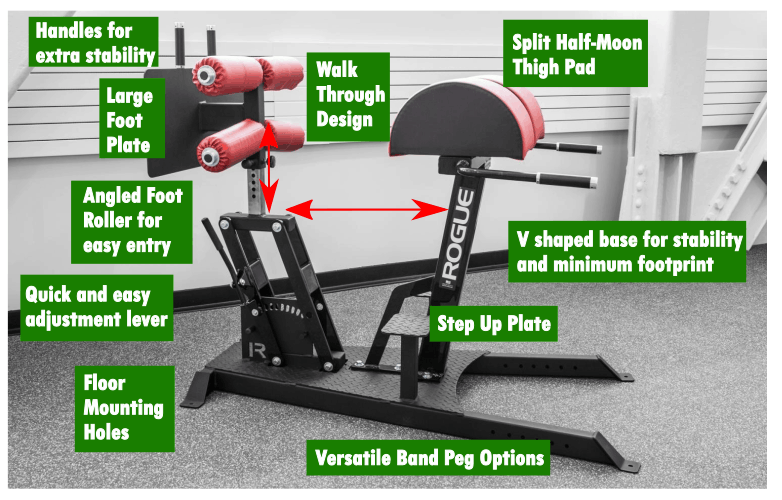 The Rogue Monster Swing Arm GHD is the ultimate GHD. 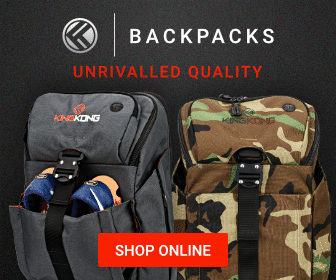 It’s got a great functional design and is ultra-stable – it weighs 250 lbs. It can also be permanently mounted to the floor – which is what we’d recommend for a commerical facility. This innovative GHD design was previously offered from Nebula Fitness, which was acquired by Rogue in the recent past. Despite it’s heft, it’s a minimum footprint unit, and it’s got a great “walk-through” design. Perfect for a commercial facility as it is a very robust piece of equipment and it is used by many university and professional sports teams. As shown, it’s in Ohio State colors – which is a custom option. The unit normally comes in all black color. 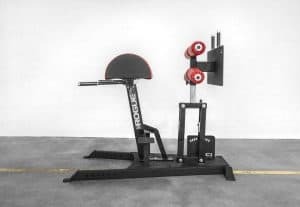 FringeSport, a scrappy little fitness equipment upstart based out of Texas, has several models of GHD device. They’ve got some good “no frills” options that work great for a small home gym and for those on a budget. Let’s take a look at each. 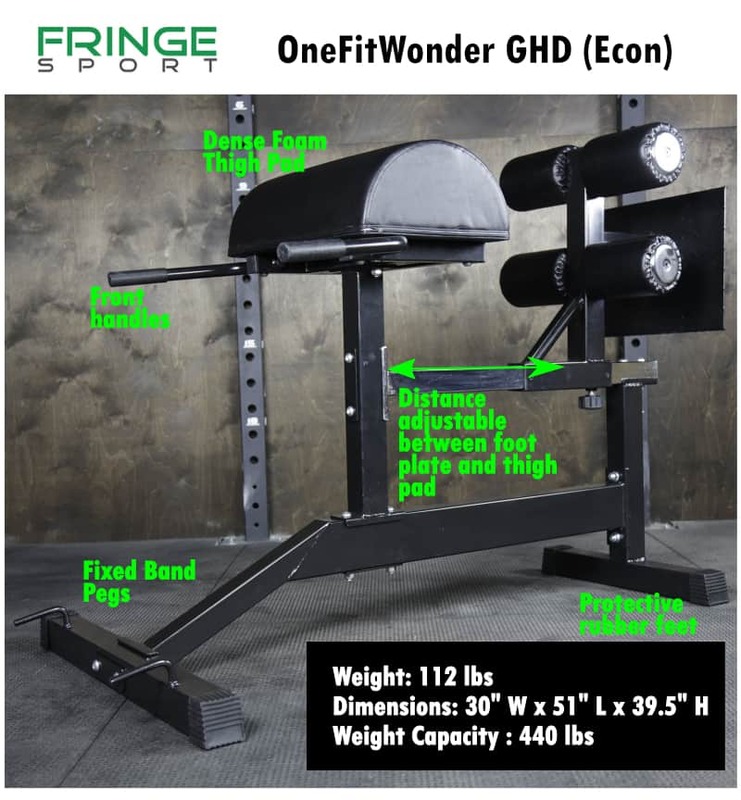 The FringeSport OneFitWonder Econ GHD is the entry-level, basic GHD from FringeSport. This is a compact design (Height and Length are shorter than other units) at an affordable price with the extra perk of built-in band pegs. 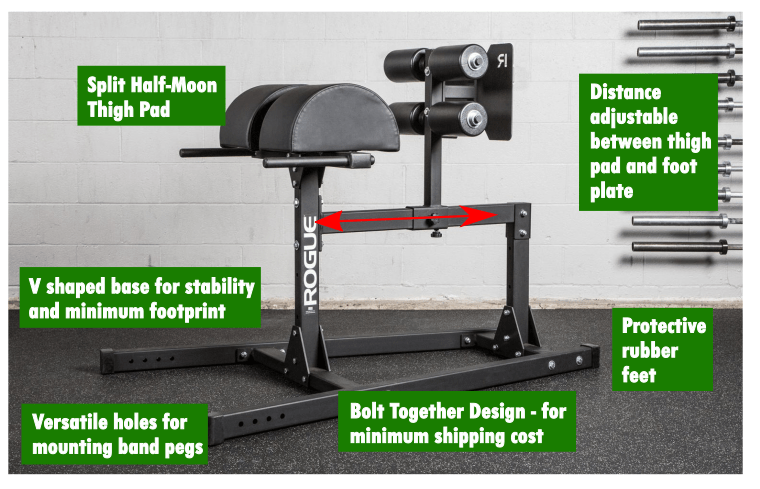 This would be a great option for a home or garage gym on a budget – or when you need the most compact option available. If you are really tall, this unit may not adjust enough for you, but probably is fine for people of average height. A step up in size and versatility is the Commercial Glute Ham Developer Pro. Commercial tough and built with 11 gauge steel. As we discussed in our article on the Glute Ham Raise, you can do “natural” glute ham raises with a minimum of equipment. But there’s some options to fit any budget. The Glute Ham Glider (Buy on Amazon) from Titan Fitness will let you do a variety of floor based posterior chain exercises for a minimum cost. Insert your toes/heels into the v-shaped notch or grab the bars with your hands to perform hamstring curls, glute raises, glute bridges, standing lunges, abdominal roll-outs and more. You could use bands to add extra resistance with this device. What we like about this item: the minimal price and footprint. You can store and use this device just about anywhere. As mentioned, it’s good for a number of exercises including ab rollouts. Users of this device report that the hamstring exercise more closely resembles a hamstring curl as opposed to a Glute Ham Raise. Besides the Glute Ham Glider described above, the GetRXd Portable Foam GHD is going to be your most compact, transportable, and affordable GHD device. GetRXd is a family-owned business that has been creating innovative and high quality fitness products for over 30 years. 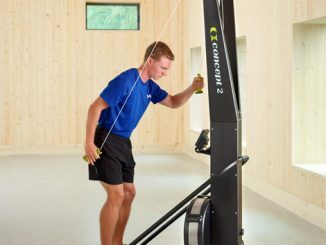 This unit can be used for a limited range of motion “Ham Raise” – the top part of the full GHR move. It does require a partner – someone will need to apply force to your ankles – otherwise you can position the pad such that your feet are flat against a wall. That will work as well. This unit is made of high density foam, has convenient carry handles, and has a removable cover. It will be the most affordable option for a home or garage gym, but it also has the most drawbacks – because you cannot perform the full set of exercises that you could on a GHD bench – and you might need a workout partner to use it. 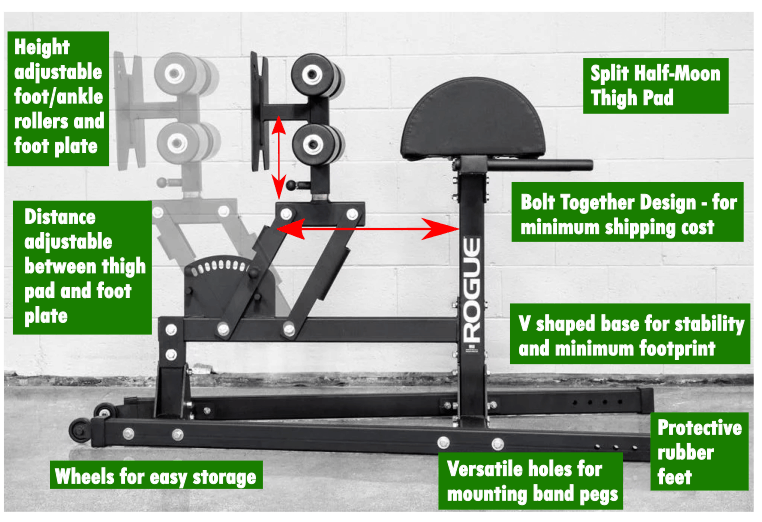 Want a bench that will take a minimum of space – such as for a home or garage gym? Orlando Barbell’s Brian Schwab has created the perfect unit – the Home Glute Ham Raise. This is a floor based product that is both affordable and compact but gives most of the benefits of a full scale model. It adjusts from 39.5” to 46.5” in length and is 21.5” in width. It can also accommodate a counter-balance weight but it is a sturdy unit regardless. This unit has most of the desirable features we like to see in a GHD. It has the single piece half moon thigh pad and is adjustable for both the distance between the thigh pads and foot plate, but also adjustable for the height of the ankle roller. It can be used for limited range back raises as well, because the unit will elevate the user off the floor quite a bit. Compare this to floor based benches that don’t have the half moon thigh pads – there’s NO range of motion for the back raise with those. The large foot plate features diamond plate steel. And best of all it’s compact and no workout partner required – necessities for the typical home gym. 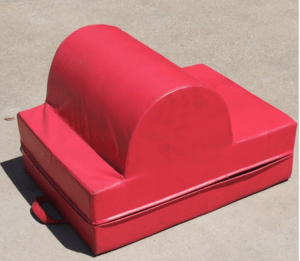 “The Home GHR is ideal for lifters of all levels since a push up or band assistance can easily be incorporated for lifters who are unable to perform the motion without assistance. Resistance can also be added with bands or weights if the motion becomes too easy.The design and angle of the Home GHR are exactly the same as a full sized model, just without the frame. 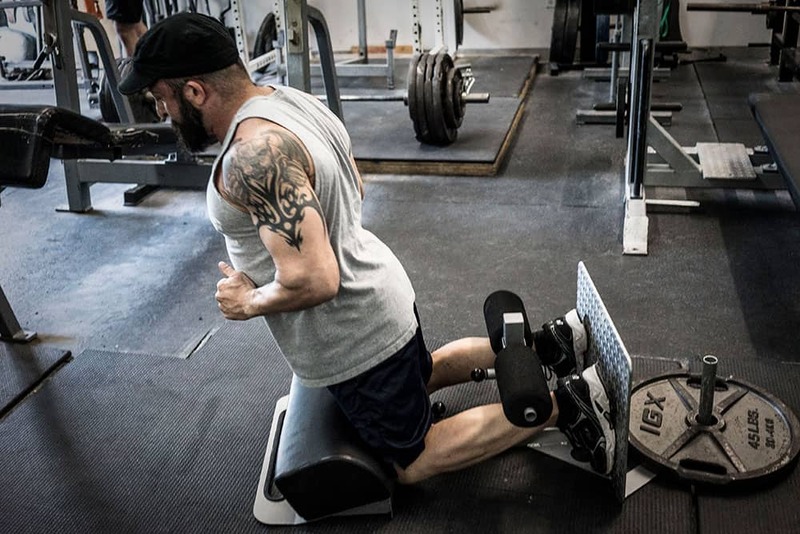 If you’re looking to focus on performing the GHR motion correctly (to parallel with the floor without incorporating momentum) while paying a fraction of the cost and taking up less space, the Home GHR is the way to go.”Brian Schwab – Competitive powerlifter and world record holder. There you go – some great options that should fit the space and budget requirements of any garage, home, or commercial gym. The photos of the Home Glute Ham Raise unit are property of Orlando Barbell and provided by Orlando Barbell. 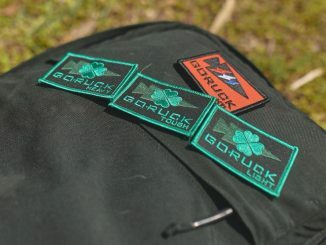 Some product imagery on this page is property of GetRXd, Inc. Some product imagery on this page is property of Titan Fitness, Inc. 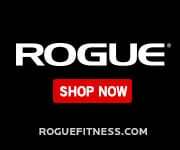 Some product imagery on this page is property of Rogue Fitness and provided by Rogue Fitness. 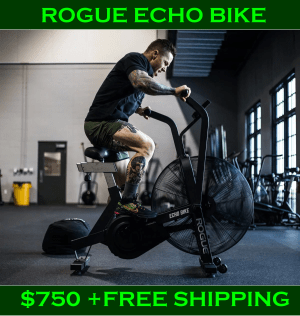 We are a Rogue Fitness affiliate, and so if you purchase equipment after clicking links in this article we receive monetary compensation. Some product imagery on this page is property of FringeSport and provided by FringeSport. 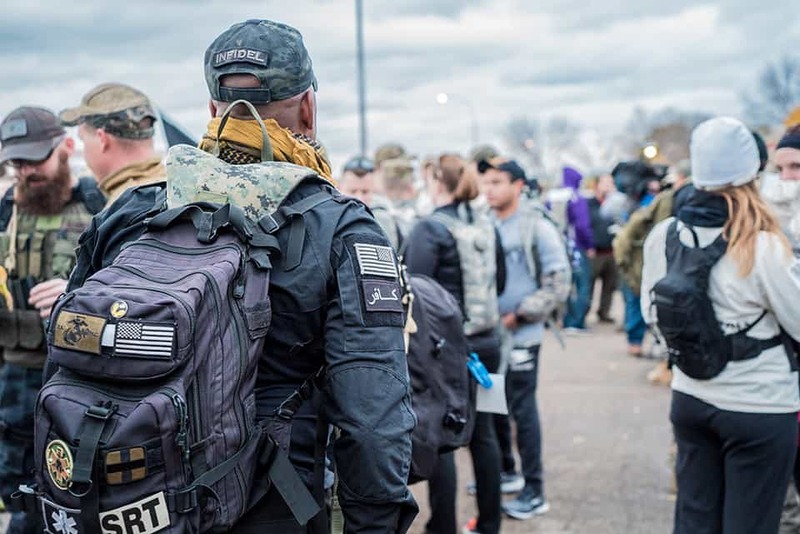 We are a FringeSport affiliate, and so if you purchase equipment after clicking links in this article we receive monetary compensation.